On a brighter-than-expected day last week (my 40th birthday, as it happens), we walked down from Soho in the mid-afternoon – after lunch at Tapas Brindisa and a record-buying splurge in the fantastic Sounds of the Universe – and across Hungerford bridge to get the train home from Waterloo. 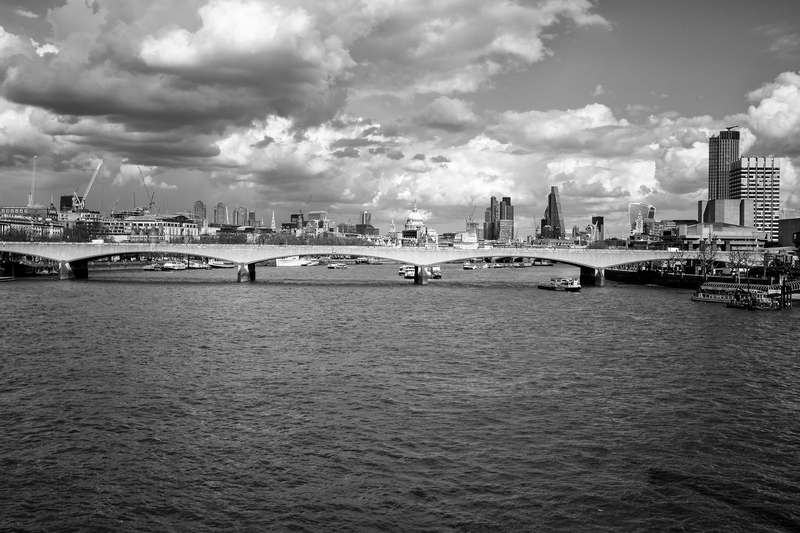 The clouds were billowing over the Thames, the sunlight glinting off the stone and concrete of Waterloo Bridge and the Southbank centre; London looking freshened up after a stretched-out grey winter. Earlier in the day we’d been to the Paul Strand exhibition at the V&A, which I’d highly recommend to anyone with even a passing interest in photography or 20th century art. Definitely worth visiting for any photographer who worries about veering from ‘their’ style: Strand changed his approach significantly a number of times through his life (one constant being his exquisite printing). With the Strand exhibition at the V&A and the Martin Parr-curated Strange & Familiar at the Barbican, London has at least two big photographic exhibitions on at the moment, both of which would reward multiple visits. There’s more to come, too, with the National Portrait Gallery’s Willam Eggleston portraits show later in the year – let me know if you’ve seen any other photography exhibitions that are worth a look!